Away from the hustle and bustle: The beaches here are pristine - quiet , peaceful, and spectacular. Fish, dolphins, turtles and birds abound. Walk along the beach as far as you desire... it is unlikely that you will find more than a few families, sunbathers, and fishernen along the way. 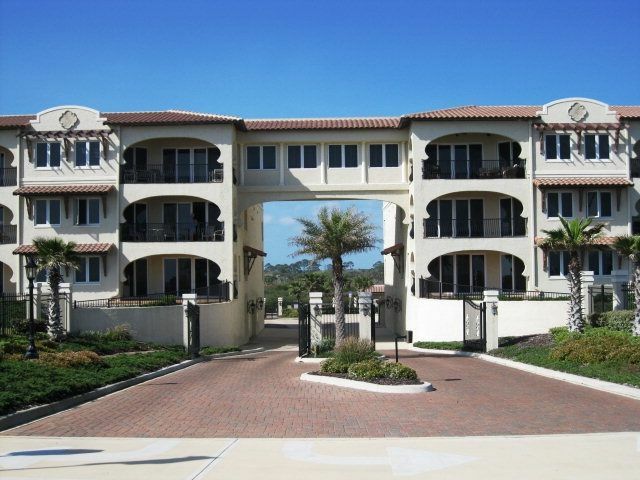 Behind the pool is access to the intercoastal waterway. Rent a canoe or kayak and go exploring!! Day trips: St. Augustine Beach is approximately 30 miles north of Flagler (Beverly) Beach. There you can explore the oldest schoolhouse, jail, and fort in Florida. Walk through the old town and enjoy fabulous shops and restaurants. Or visit the outlet mall. Orlando's park attractions (Disneyworld, Sea World, Epcot, and Universal Studios) are approximately an hour and a half to the west of Flagler Beach. Daytona Beach with its amazing Speedway is a must-see. Tours are offered daily. And don't forget to visit the Kennedy Space Center!! Magic! I fell in love with Oceanside at first sight - and became a homeowner within 2 months! Come and experience the magic of this special place. You just might become a permanent resident, too! I fell in love with Oceanside at first sight in March, 2011 - and became a homeowner by April, 2011! Come and experience the magic of this special place. You just might become a permanent resident, too! Quiet, peaceful, clean, safe, warm, relaxing... out of the hub, but close enough to find action when you are ready! Atlantic Ocean is the backyard, Intracoastal Waterway is the front yard! Fresh white towels are available for your bathing pleasure. See the ocean from both the living room and master bedroom. This condo also has a large patio and sunning deck. Built along A1A also know as Oceanshore Blvd in Flagler County this unique property has access to the most beautiful turquoise water and coral colored sand. It is a must see of Florida Beaches! Provides step-free access if you wish! Not sure if it meets ADA code, but I think that wheelchairs can be accommodated in most areas. This condo is on the first floor and is walk-in accessible from the beach through the patio doors. No long elevator rides every time you come and go! To enter the front door guests may use the elevator or the stairway. I believe that the condo is wheelchair accessible, however the water closets may not be wide enough. Oceanside was just what we were hoping for and we will look forward to come back next year! We have stayed in this beautiful condo many times. Beautifully decorated with all the comforts of home. The semi private beach is peaceful and relaxing and the pool is cool and sparkling. Debbie welcomes you as a special guest and is most accommodating. You will not want to leave. Thanks, Carol! I love having you and your family stay at the condo, and am delighted to know that you find it as peaceful as I do! We wanted a quiet peaceful vacation for the family and this property hit the spot. Debbie was wonderful to work with and she made sure that we were well taken care of. This property is a perfect choice for anyone who wants to have an uncrowded beach and privacy, but still be close to all the action in St. Augustine and Daytona. We highly recommend Oceanside and are ready to go back. Thank you, Warren! I look forward to your return to Oceanside! Beverly Beach is located 30 miles south of historic St. Augustine and 30 miles north of Daytona Beach. Visitors can travel to Disney World or to the Kennedy Space Center in a little over one hour. This historic sights of St. Augustine are a great day trip! For the history buffs the train tours are great and full of information. Outlet shopping just north of St. Augustine on Hwy 16 Exit is fun for the super shoppers! Light houses in both St. Augustine and Ponce Inlet are interesting and a good workout for those who like a challenge of climbing to the top. So much to do in the area - you can go deep sea fishing from St. Augustine Marinas and Daytona Beach Marina. 12 Plex movie theater in Palm Coast (minutes away) along with your favorite chain restaurants. Many famous local restaurants up and down the coast to try from St. Augustine to the Space Center. Call your rental agent for a recommendation! Minimum week stay - $1700/week A non-refundable deposit of $500 locks in your desired vacation dates (applies to rental fees). Pet fees are $20 per night per pet. Up to $200/month in utilities is included in the rental fees. Overages will be charged to renters.